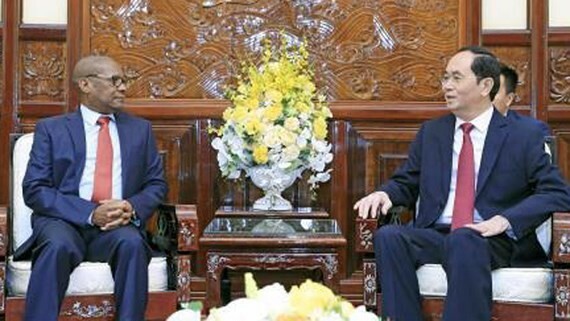 South African Ambassador Mpetjane Kgaogelo Lekgoro and Ambassador of the Arab Republic of Egypt Mahmoud Hassan Nayel visited and presented credentials to Vietnamese President Tran Dai Quang at the Presidential Palace in Hanoi yesterday. At the reception with the South African ambassador, President Tran Dai Quang hoped that the new ambassador would have active contributions in strengthening further the friendship, economy- trade- investment cooperation relations; especially in the sectors of education, tourism, mine ores, resources and environment. President Tran Dai Quang expressed his belief for role of the ambassador in the new working term, and desired that the Egyptian ambassador would foster exchange programs between the countries’ high- ranking delegations, aiming to reach the two- way trade turnover up to US$ 1 billion.